TEXAS GO VEGAN WEEK - A week-long celebration of Vegan Living in Texas! In 2011, our campaign expanded to a week-long celebration and education campaign promoting vegan living called "TEXAS GO VEGAN WEEK". Our campaign kicks-off the start of Vegetarian Awareness Month and ran last year from October 1-8, 2011. 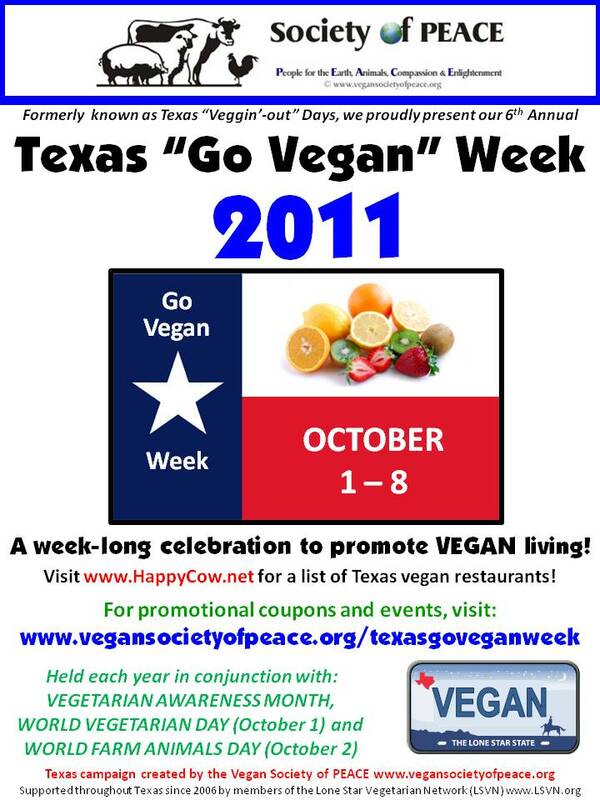 This year, our TEXAS GO VEGAN WEEK is October 1-7, 2012! Please support all vegan food establishments and vendors in Texas during our campaign! You can visit our friends at HappyCow.net for listings of vegan restaurants in Texas. Help promote our Vegan Society of P.E.A.C.E. outreach campaign! TEXAS GO VEGAN WEEK is a week-long celebration to promote vegan living. Please join us by getting involved during the first week of October! 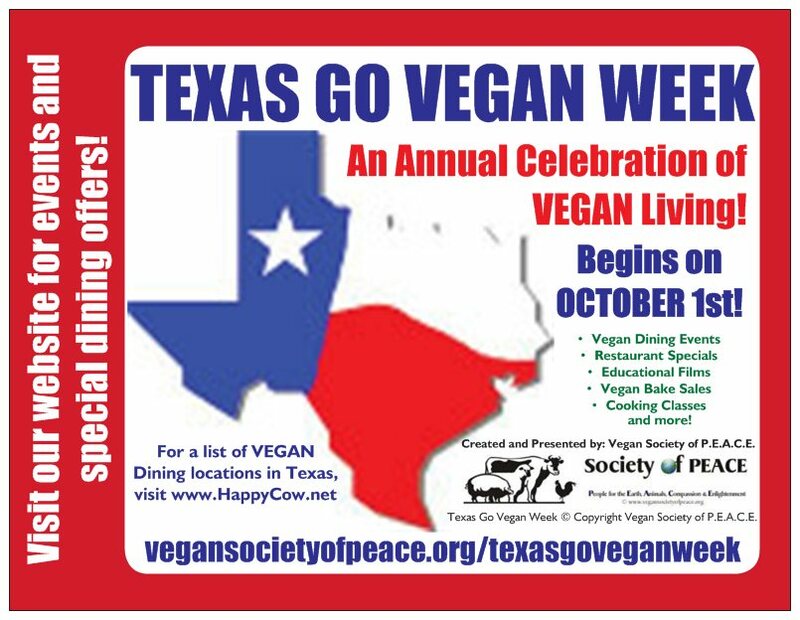 Our 2012 TEXAS GO VEGAN WEEK EVENTS can be found here! Be sure to also visit the Vegan Society of P.E.A.C.E. Community Events Calendar for events taking place all week! Submit your event to texasgoveganweek@vegansocietyofpeace.org! Our 2012 TEXAS GO VEGAN WEEK special offers from participating Texas vendors can be found here! f you are a vendor in Texas and would like to participate in TEXAS GO VEGAN WEEK by giving special discounts and coupon offers this week, please contact us! We also provide a QR code to link directly to the special offers from any SmartPhone, IPhone or Android. You will be added to our offers page and have your logo displayed with website link. 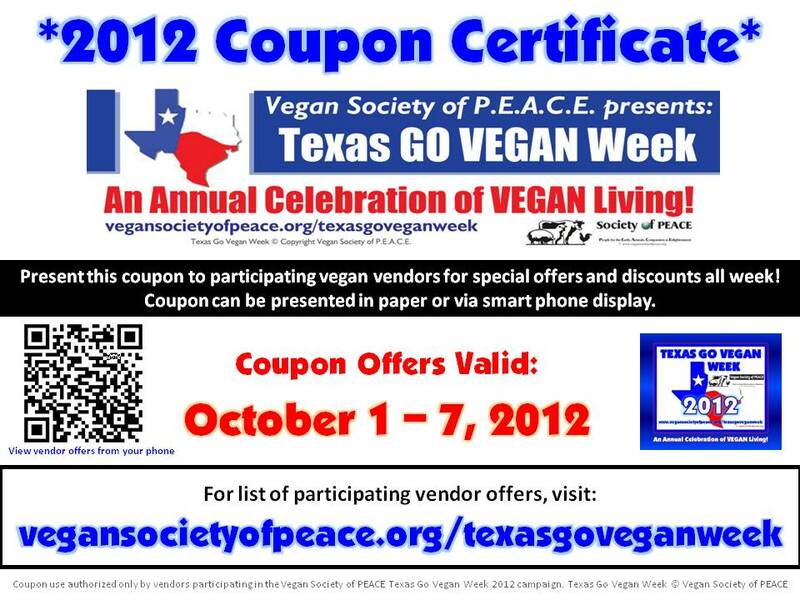 TEXAS GO VEGAN WEEK 2012 COUPON and QR CODE for smart phones is here! Be eco-friendly! Scan QR code or display this image from your smart phone. Click on image to print in PDF format.